USCG-Official 2013 United States Coast Guard Holiday Ornament, Authorized USCG, 24KT Gold Finished, Made in the USA by the Makers of the Official White House Ornaments, Start or Complete the Entire Military Services Collection, Date not on ornament. 2015-Wooden-Easter-Egg 2015 - White House Wood Easter Egg, VERY RARE, Annual Wooden Egg Roll Eggs, President Barack Obama Signature, Complete Set of 5, USA Made Hardwood- When Sold, they are gone forever! 2016BABY55924 2016 Baby's First Christmas Ornament, 3-D, 24KT Gold Plated, White House Gift Shop, Made in USA! 2016-RoseGoldEgg 2016 White Easter Egg, Heirloom Series, 24KT Gold Finish, EAST ROOM SWAGS, Stands Alone or Use Its Gold Cord on Easter Tree, Handmade in USA. 56250-USAWREATH 2016-USA Wreath, Flag Elements Ornament, 3" diameter, Multi-Dimension, 24KT Gold Plated, White House Gift Shop, Made in USA! 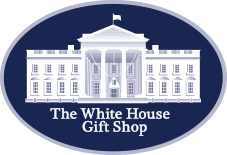 HUGE 2018 Complete White House Ornaments, President Trump Coins, 2 Ornaments and 2 Coins, USE CODE: FRIEND FOR SPECIAL 50% MEMBER INSTANT REBATE AT CHECKOUT! 2018-WHHA 2018 White House Historical Association Ornament: President Harry S. Truman, South Balcony and Blue Room. Made in USA! 2018-whitehouseornaments 2018 White House Ornament, 50% OFF SALE, Celebrating President Donald J. Trump: Foundations of Success, N Korea Peace Talks, New Leadership, A New Era- Our Most Elegant Ornament EVER! 2019-White-House-Ornament 2019 Official White House Gift Shop Ornament is Titled: President Dwight D. Eisenhower & His Electric Car, Features Full Color 3-D Ornament of the Car Eisenhower Drove in His 1952 Election Campaign! 28114-3DANGELSTAR 3D Angel With Star Ornament, 3-D, 24KT Gold Plated, White House Gift Shop, Made in USA! AF1BLUELAQ1 Air Force One Presidential Blue Lacquer Roller Ball Pen, Gold Trim, 1 Pen, Capped in White House Presentation Box, New Photo Soon.